Applications are invited from suitably qualified Nigerians for appointment to the post of Bursar, Ambrose Alli University, Ekpoma . 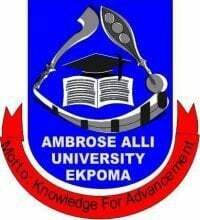 The Government Council of the Ambrose Alli University, Ekpoma wishes to announce that the post of the University Bursar is vacant. Accordingly, applications are hereby invited from suitably qualified candidate to fill the vacant post. JOB DESCRIPTION:The Bursar is a Principal Officer and as the Chief Financial Officer of the University is responsible to the Vice-Chancellor for the day-to-day administration and control of the financial affairs of the University. TENURE: The University BURSAR shall hold office for a single term of five years and on such terms and conditions as specified in his/her letter of appointment. THE PERSON: Applicants for the post of Bursar must have in the past exhibited considerable degree of competence, responsiveness, demonstrable integrity and transparency on matters of financial resource management. Applicants must be in good health and able to endure the rigours of the duties of the Bursar. Also, candidates must be found to possess the following qualities: vision, proven academic distinction, managerial ability, integrity and transparency in private and public life. In addition, candidates should have the ability to develop linkages with external communities to support emerging needs of the University, command respect and arouse cooperation and loyalty of staff and students of the University. Full names, date of birth, permanent home address, current postal home address, current postal address, nationality, marital status , number and ages of children, Educational institutions attended with dates, Academic/Professional Qualifications (including dates and granting bodies), list of scholarly publications, statement of experience including full details of former and present employers with current salary, other activities outside current employment and names and addresses of three(3) referees. Applicants should request their referees to forward on their behalf confidential reports directly to reach the Vice-Chancellor before the date of interview. The University Bursar who is the Head of the Bursary Department should have a Bachelor of Science Degree or its equivalent in Accountancy plus 18 years post qualification experience or possess ACCA or ACA or ANAN or ACMA plus 15 years post qualification experience. The candidate must also possess a record of good health. He/she must be ICT compliant.